This year is the 20th anniversary of our Annual Book Sale and promises to be bigger and better than ever before. It's on at Sutherland Library from Friday 22 May until Sunday 24 May 2009. If you’ve never been to this event before, why not come along this year? Bargains galore from a huge range of books and magazines – fiction, non-fiction, children’s and adult books, discards from the collection, surplus donations and more. The sale is held over 3 days with stock being replenished regularly. 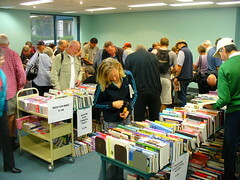 Proceeds from the Book Sale are used to fund library projects.